When talking about upper body workouts, you can’t forget to mention the pull-up. It’s so important that people literally call it the upper body squat and there is no way anyone will take you seriously until you’ve mastered it. In comparison, the lat pull-down exercise isn’t even close in importance to the pull-up, even though it can add great variety to your workout. It’s supposed to be used on occasion but it’s nowhere as important as the pull-up, which is by far the most effective upper back developing exercise. It’s the best because it achieves the maximum possible neuromuscular activation, unlike all the other exercises which don’t have this effect on your back. The pull-up is a test of your mettle, both physical and mental, but it’s mostly regarded as an exercise that can test exactly how much functional strength you have. This is because it measures strength to weight ratio in a better fashion than every single other exercise for your back. However, when you look at the numbers you will see that most people, men and women, can’t even do a single pull-up, since you can only do them if you’re strong. Sorry to say it, but if you can’t do pull-ups, you have a long way to go until you’re actually considered strong. If you want to build muscle mass on your upper body and boost your upper body strength as much as possible, you want to look at these five tips that you can use to achieve your goals. Doing pull-ups is really basic when it comes to the level of strength you need to have to achieve them, so this means that women, heavier people of both se**s and physically weaker folks may not be able to do more than one rep, if any. While this doesn’t mean that I’m saying that you should use any assisted pull-up machines, I am saying that you should get some resistance bands. 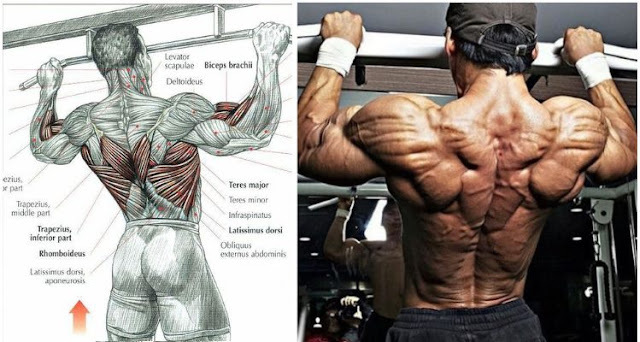 When you use assisted pull-up machines, they don’t make use of your upper back muscles which have a role to stabilize your body, but when you use resistance bands they help you recuperate, adding momentum to the upward movement of the pull-up (concentric part), which is the hardest. Sometimes, that little momentum is all that you need to complete your pull-up. When buying resistance bands, know what you want – you can discern them by color, which indicates different tension. Yellow is the weakest, with least resistance, while blue, black and orange offer the most tensile strength. If you want something I between, go for red and green, but if you’re just starting now, make sure to pick one that will let you do at least five pull-ups. When you reach the ability to do 12 of them, get a lighter resistance band and start over until you can do them without bands. If you want to be able to do a consistent number of reps, you will need to learn to do them on your own! This means that you actually have to become stronger instead of stagnate in one place. Building strength can only be come when you’re exercising at the very least at 80% of your maximum effort. Try some bent-over or inverted rows or some TRX rows to pump up your intensity and build more strength. You can also try some other varied exercises. Eccentric pull-ups have also been observed to be a great path to building strength. To do them, lower yourself slowly until you straighten your arms, then jump up and do it again. Your muscles will always have more power when you’re going down so it shouldn’t be too hard. I suggest you start with three to six seconds of descending and increase that time as you continue your workouts. When you can do at least six eccentric pull-ups with decent control over your body, you should now be able to do a full pull-up by yourself! The supinated grip is also one of the best for activating the latissimus dorsi and upper arms, even if it is the most basic method of them all. Sometimes, you might get tired or your grip might get sloppy. To remedy this, get some chalk or some wrist straps. This is a favored method amongst trainees since it lets them lift more and finish their sets even if their forearms are becoming tired before their upper backs. If you’re doing a lot of exercising, using chalk or some wrist straps will help you get to your goals and even surpass them. You need a lot of strength and endurance to do pull-ups, and both of these things are created with vastly different rep ranges. Strength requires low reps, whereas endurance needs high reps to be built. This means that you should be getting some dip belts, resistance bands and weighted vests to help out. To build strength, exercise for about four weeks with a dip belt, ranging from four to six reps per set. To build endurance, get some resistance bands and exercise with 10-15 reps per set. You will need the resistance bands, and a variety of them because using the different tensile strengths correctly, you can achieve results and increase your rep numbers with incredible speed. Get your technique straight in order to make any progress, and this counts for any exercise. You should begin from a dead hang position, where your shoulders are close to your ears and with your arms completely straight, with retracted shoulder blades. When you start pulling, squeeze your abs, keep your eyes on the bar above you and push your chest up. Pull towards the bar and keep your chest in the driver’s seat, while your legs should be in a straight line with your torso as much as possible. If your chin passes the bar or your chest reaches it, stop and observe the contraction. Then, start lowering yourself with as much control as you can muster, until you reach the point that you started from, with your arms straight and you shoulders retracted. Finally, make sure that your shoulder blades are tight because if you try to do a pull-up with a loose shoulder girdle, you might get yourself a rotator cuff injury. These five tips ought to help you do pull-ups as much as you want, like they’ve helped countless others before. Just make sure to train with consistency and you will be well on your way to doing some great pull-ups. Also, you might want to explore the possibility of taking some supplements to aid your recuperation and progress. There are a bunch of different combinations out there, but I’d suggest something which is a mix of high quality protein, creatine and amino acids. When combined, these three make a post-workout shake that refuels you as easy as you refuel your car at the gas station, and you will recover much more quickly, but you will also hurt less.